The nobleist of the fey races is the Cluricaun. They are the race who can become the most powerful of any of the fey. Among them are the nobility, the leaders, and the greatest fey heroes. Before the coming of man, most worlds had at least a few of these wondrous beings, but when civilization pushed the forests back, most retreated to the feywilde. Countless shee have had their lives ended, or ended them by their own free will, as the places for their kind have become fewer. Cluricaun have several clans distinctive by their headdress. Some have animal horns or antlers, some have bird crests, some even have tree branches and foliage for hair. The Clurican are cousins to nymphs and dryads. The race of elves are the muryan scions of the shee. The Cluricaun are not arrogant; they are at peace with themselves and believe themselves no better than any creature great or small. Some Cluricaun have become corrupted by the devastation there race has witnessed. These of the Nightmare court are the worst of the worst, cloaked in darkness, arragent and malicious. • Medium-sized: As Medium creatures, Cluricaun have no special bonuses or penalties due to their size. • +2 Wis, +2 Dex, +2 Cha. Cluricaun are incredibly charismatic, quick and wise. This make them all the more heroic when they lift their bows and swords to fight. • Cluricaun’s base movement speed is 30 feet when walking. • +2 on Diplomacy and Sense Motive checks. • Low-light Vision: A Cluricaun can see twice as far as a human in dim light such as starlight, moonlight, or torchlight. Personality: Cluricaun are the most somber of the fey, for it is they who realize most intimately that their people are fading. They are intense, passionate beings, whose only fault is that they are prone to care too much. Thus it is that certain of their number become evil and join the Nightmare Court, where they use their natural and acquired abilities to inflict the same pain they bear upon the mortal world. A Cluricaun is never without honor or manners, even when he knows he must kill. They are polite to a fault and respect those who understand etiquette. They appreciate beauty in all of its forms, whether social, aesthetic, or natural. Physical Description: The Cluricaun, ranging from 5’5” to over 6 feet. 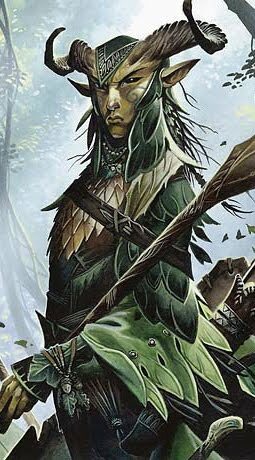 Relations: The rest of the fey look up to the Cluricaun, as they are believed to be the most favored of the Overmind, and there is a certain amount of instinctive reverence among the other fey. The shee are usually the least accessible of the fey when it comes to mortals, for they are wrapped up in the struggles of the fey. However, when the time comes to treat with mortals, the Cluricaun are at the forefront of diplomacy. Few who encounter them mistake their majesty for arrogance. Language: The Cluricaun have no language of their own, since in fact, it was they who developed Sylvan. Male Names: Abarta, Aengus (or Angus), Dagda, Quillione, Latheriean, Milverian. Female Names: Ainé, Ana, Aoibhinn, Holle, Lhiannon, Lorelei, Mebd, Nimue. Adventurers: Cluricaun only adventure for a great and compelling cause, whether good or evil. They are acutely aware of their mortality and are less willing than most to risk death before their work is done. However, when a great threat arises, they commit to the fight, using everything they have against whatever it may be. Evil shee take much the same philosophy, except that they define mortals as a great threat.